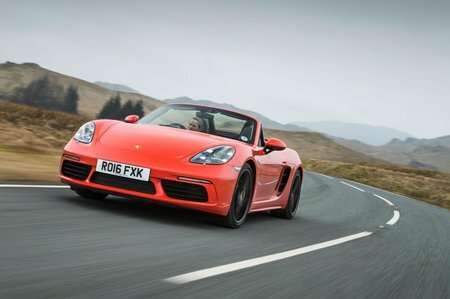 Porsche Boxster 2.5 GTS 2dr 2019 Review | What Car? The (for now) range-topping GTS gets black plastic skirting, dark 20in wheels borrowed from the 911 Carrera S, tinted lights, Alcantara interior trim and plenty of model designations. It also comes with Porsche Connect, which brings sat-nav and Apple CarPlay. The principal hardware changes are the addition of Porsche Active Suspension Management, which sits the body 10mm lower than a Boxster S, and there’s also a mechanical limited-slip differential for the driven rear axle. The GTS model uses the same 2.5-litre turbocharged flat-four engine as the S, but boosted to produce an extra 15bhp. Fitted with the standard six-speed manual gearbox, the 0-62mph time is the same as that for the S at 4.6sec, although adding the optional seven-speed PDK auto 'box does make it a tad quicker. You get a sports exhaust as standard, but sadly that doesn't make the GTS sound any less like an original VW Beetle, but it does feel the smoothest and freest-revving of all the Boxster engines.